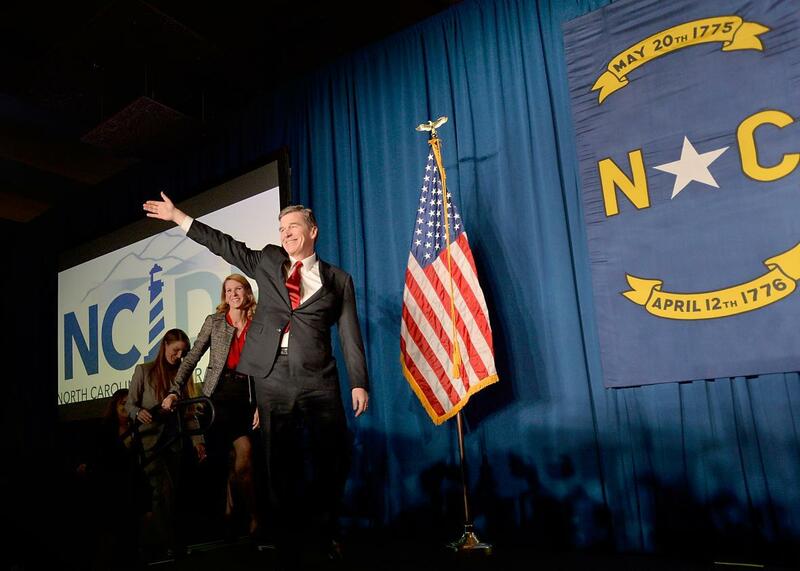 Court strikes a blow against North Carolina GOP’s legislative coup. North Carolina Democratic Gov. Roy Cooper. A North Carolina state court struck a blow against the General Assembly’s legislative coup on Tuesday, blocking the Republican-controlled assembly’s attempt to make Democrat Gov. Roy Cooper put his Cabinet appointment to a vote in the senate. Before Cooper assumed office, governors were permitted to appoint Cabinet secretaries without legislative interference. But after Cooper’s November victory, the Republican-dominated Legislature moved to limit his power in multiple ways—including granting itself the ability to block his Cabinet appointments. This legislative aggrandizement, Cooper argued in court, violates the North Carolina Constitution, which declares that legislative and executive power “shall be forever separate and distinct from each other,” and vests all of “the executive power … in the Governor.” Because Cabinet secretaries oversee executive agencies, Cooper asserted that the Legislature’s attempt to exert control over the secretary selection process impermissibly infringed on his “executive power.” In order to maintain the strict separation of powers required by the state constitution, he argued, the courts must invalidate the Legislature’s attempt to demand senate approval for his Cabinet. The Legislature’s rebuttal may initially seem compelling: It cited a provision of the state constitution that reads: “The Governor shall nominate and by and with the advice and consent of a majority of the Senators appoint all officers whose appointments are not otherwise provided for.” On its face, this “advice and consent” language would seem to mean that, in fact, the state senate has the constitutional authority to insist upon holding hearings for cabinet appointments, and blocking those of whom it disapproves. But in 2016, the state supreme court issued a ruling that strictly limited the power granted to the Senate by this clause. According to the court, the clause applied only to “constitutional officers”—that is, heads of departments explicitly created by the state constitution. The senate could require its “advice and consent” for the appointment of such constitutional officers, the court concluded, but it could not insinuate itself into the governor’s selection of nonconstitutional officers. Cabinet secretaries are nonconstitutional officers. Their positions are created by statute, not the state constitution. Thus, under the state supreme court’s authoritative interpretation of the state constitution, the Legislature has no power to demand that it provide “advice and consent” before they are appointed. Given this constitutional bar, the three-judge panel properly blocked the senate from holding confirmation hearings on Cooper’s cabinet appointments. This ruling may seem odd to those of us most familiar with the federal system, whose conception of separation of powers still allows for Senate approval of Cabinet positions. But as the state supreme court explained in that landmark 2016 decision, North Carolina has a unique constitutional history with regard to executive appointments. Although the North Carolina governor has historically had limited powers, he or she has always had extensive control over personnel decisions within the executive branch. The original version of the state constitution’s Appointments Clause gave the governor exclusive power to appoint all officers, both constitutional and statutory, unless the constitution explicitly provided otherwise. This clause was later amended to allow for some legislative input. But to this day, it still affords an unusual amount of authority over appointments to the governor. Tuesday’s decision marks the second major blow against the General Assembly’s aggressive effort to seize power from Cooper, who defeated his Republican predecessor Pat McCrory by a slim margin in November. A different three-judge panel blocked the Legislature’s effort to strip Democratic control from state and county election boards in January; control of the boards typically goes to the party of the governor, but Republicans attempted to revoke this rule after Cooper won. The period following Cooper’s unlikely triumph was marked by a startling disregard for basic democratic norms on the part of Republicans. It now appears that, thanks to the courts, the rule of law is returning to North Carolina.